Here’s a fun and easy craft for your children or students to put together and either paste in their math journals or hang up as a decoration on the wall of the classroom. 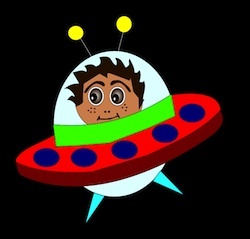 Cut out the parts of a spaceship and piece them together, then add up the numbers in each spaceship part to come up with a sum to enter into the tailpiece of the spaceship. The spaceship parts can contain easy (single digit) or challenging (double digit) numbers, and can be printed out in color or in black and white so that your students can complete the coloring themselves. If you’re a teacher or parent teaching mathematics to your students or children, why not do it in a fun and creative way? That way, as they grow older, they will retain the notion that they can have fun while doing math. 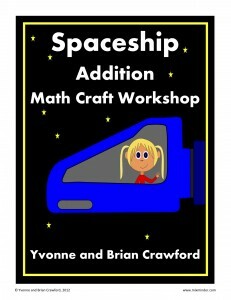 Math craft workshops are places where kids can learn left-brained stuff in a right-brained atmosphere. Math crafts can be completed in a classroom setting, or by kids at home in their math journals or doing Mathbooking (a creative cross between mathematics and scrapbooking). As they’re cutting, pasting and coloring, they’ll also be adding, subtracting and learning about numbers. You are very welcome. Thanks so much for checking it out!